M-System’s model TR30-G is a web-based data acquisition system which enables users to view and access stored data via an internet browser. Freed from a dedicated display screen, accessibility and portability of the data is greatly enhanced. In addition, users can receive free benefit of ever-evolving state-of-the-art user interface and apps provided by tablet terminals: e.g. ultra-high resolution screen, intuitive touch panel operations, entering comments by dictation or hand-writing, capturing a screen shot and e-mailing, etc. The compact logging module together with I/O modules can be mounted next to a PLC in a panel, at the same height and depth. The R30 Series I/O modules are available for use with the TR30-G. The following types of I/O modules are available. In addition, remote Modbus slaves can be connected up to 12 nodes. At the maximum of 64 analog inputs (16-bit data), 64 discrete inputs, 64 discrete outputs, 32 pulse inputs (32-bit data) plus 32 function inputs (mathematical, logic, filter, etc.) are usable. At the maximum of 120 channels can be plotted on the charts and stored at the storing cycle of 1 minute. The fastest storing cycle is 5 milliseconds for 16 channels, 100 milliseconds for 32 channels. The TR30-G has a large main memory of 4 GB (used up to 2.5 GB at the maximum) divided into 50 memory blocks just like chart books for a chart recorder. Trend data is stored in binary format, and each memory block in the main memory is transferred to an auxiliary SD card memory in a regular interval, either in the binary format, or converted into CSV. Files can be uploaded to a remote PC via FTP client or server function. Automatic file delete function can be set to automatically discard the oldest files when less than 100 MB memory area is free. 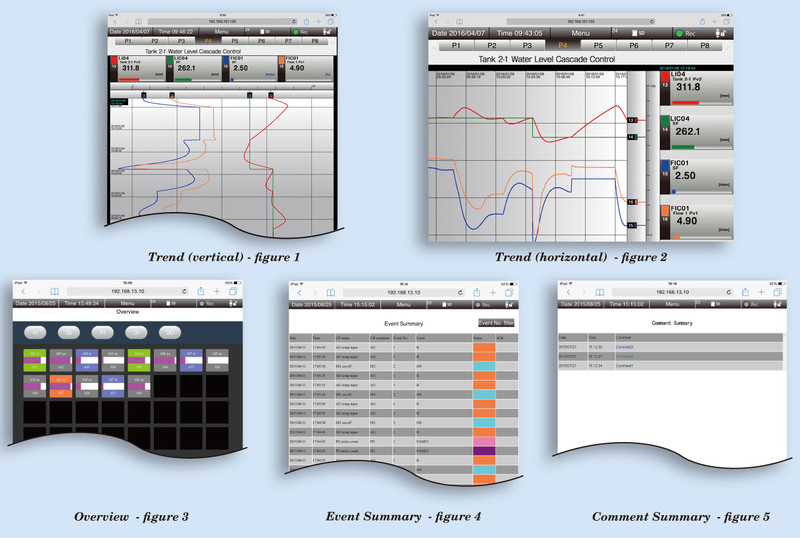 The TRViewer program is available for Windows PC to view and manage historical trend graphs and convert binary format data into CSV. Pre-listed recipients can receive an e-mail notification with data values when a channel trips alarm threshold. Regular reporting is also available. At the maximum of 32 text message templates and 32 recipients can be set. The TR30-G is adoptable with daylight saving time by specifying the beginning and the end of daylight saving time. The internal RTC is automatically adjusted at the startup, at 0, 6, 12, and 18 hours of every day. Interfacing with SCADA or PLC as Modbus master is possible. Data stored in multiple TR30-G can be collected by a SCADA, or a PLC can be used to control the start/stop of the logging, to force memory block transition, to trigger a comment entry, etc. Basic configuration composed only with TR30-G and a Wi-Fi access point. A tablet is used for simple field monitoring, while a PC may be used not only to monitor but also to build up a report by an user’s application. 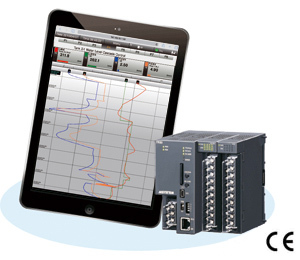 The TR30-G (Modbus Master) can take in remote I/O data (Modbus Slave) on the Modbus/TCP network. Max. 12 slave modules. Data can be accessed via Internet. Max. 4 client terminals can access the TR30-G at once. The clients only need an internet browser application. *2. A static IP or dynamic DNS is required. Operators can bring in tablets and smart phones to access trend data while freely walking around the site. They can also transfer data to their PC via FTP or via SD card to build up daily/monthly reports using their own application software. Researchers can access data logged in a remote building while they work in their own office.